Are you happy, and if you are what do you think causes your happiness? In one of the articles I found about happiness, the writer suggests it's only a choice to be happy or not. Contrary to popular belief, happiness doesn’t come from fame, fortune, other people, or material possessions. Rather, it comes from within. Happy people are happy because they make themselves happy. They maintain a positive outlook on life and remain at peace with themselves. What do you think? What makes you happy? 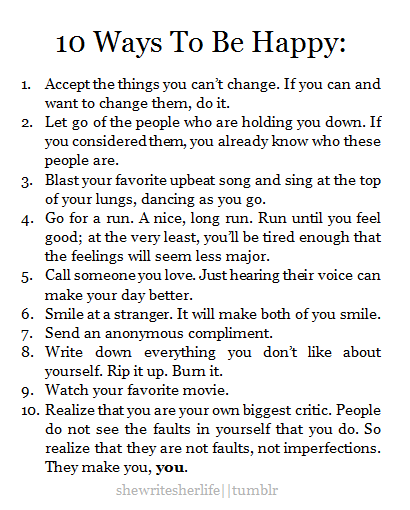 If you don't have a clue and want to get some tips to become more happy, you can look at the article and read 22 things happy people do differently. Do you recognise your lifestyle in these tips? I guess happiness is a hard theme, but it definitely is something that comes from the deepest place of us, and because of this we can enjoy simple things, and bear the difficult ones.. I'm a very happy person in general. Obviously there are always petty little annoyances that pop up from time to time, but that's life! Very relative question. Depends upon the mood, circumstances, work, living style, environment etc. But, I agree with @mheredge I'm a happy person too because of positive thinking. I am happy because I am contented with what I have not what I should have. No surprises that I'm a positive person (most of the time). I don't deny sadness, but I turn my back on misery. I think people who wants to be happy find their ways to be happy even in little things. I often corelate my happiness with surroundings, people whom with I'm attached. I feel happy when I see smile on the faces of others because of me. Regarding my own life, I'm quite satisfied with what I have and least care about what I have not in my life. I'm happy person .. there are different things make me happy. from one those thing to watch football game and enjoy with my family . if i am going to speak about my happiness.. i'll say that i have some people in my life that makes it marvelous and always help me to do and to say . @phutai that's great but I think happiness isn't about money. Yeah, with money you can buy all the things which will make you happy but it's like "you can buy the most comfortable bed with money but you can't buy sleep". @lolo hehe same here but I watch cricket with that spirit. If my team wins I feel very happy but if they loses the match I get upset. Wow..Wonderful thoughts in the morning..Actually I was sad because of my colleague who always insult me in front of others in meeting. But now after read the line 'Happy people don’t care what others think of them. They follow their own hearts without letting naysayers discourage them. They understand that it’s impossible to please everyone' I feel positive and its give me strength. @Aboumalik trips can give you a different mood and keeps you relax mentally. Why couldn't you make it? @shasha yes. Its all about you not others so keep yourself calm in any such condition. Like you @rahil11, my surroundings have a lot of influence on my happiness. Also seeing other people smile is important. @Aboumalik I also love hiking-my favorite hobby. But, due to hot weather I couldn't resume if for the last 8 months. Mmm @bubbli do you like hitch-hiking? This is very different from hiking. I have only hitch-hiked a few times but I don't like it particularly. But I love hiking. @mheredge I hitch-hiked once. But I love hiking as my experience is memorable. Things being uncomplicated make me happy. I was missold an internet pack a couple of days ago. It wouldn't work on my tablet as it turned out it would only work with tablets that don't also function as a mobile phone, which my tablet does. I never knew that this could be an issue, as certainly I'd never come across this as a problem before. Whilst the Orange France company manager sorted it out, he told me Orange can't refund me for their mistake. He gave me an alternative package, but one worth half of what I paid and lasting one instead of six months. On top of this I must have queued around three hours and was passed to and from their two shops three times. I was not a happy bunny yesterday afternoon!